Tough loss for the Ukraine on opening night of EuroBasket 2011. We were down by only two points with three minutes remaining in the fourth quarter. But due to turnovers and poor rebounding, we allowed Russia to go on an 8-2 run and win Game 1: 73-64. Hopefully we will have better results tonight when we meet Slovenia at 9:00 PM local time. Photos courtesy of Oleksiy Naumov from the Ukrainian Basketball Federation. Ukraine vs. Slovenia Game 2 will be available On Demand at 2:00 PM EST at http://www.fibatv.com/Europe/Live. All four of the teams that finished the prelims at the top of their groups have made their way to the semifinals: USA, Lithuania, Turkey and Serbia. Team USA is looking to reclaim their first World Championship since 1994. On Thursday they had to get past Russia in the quarterfinals. Russia played smart and hard for three-quarters of the game. 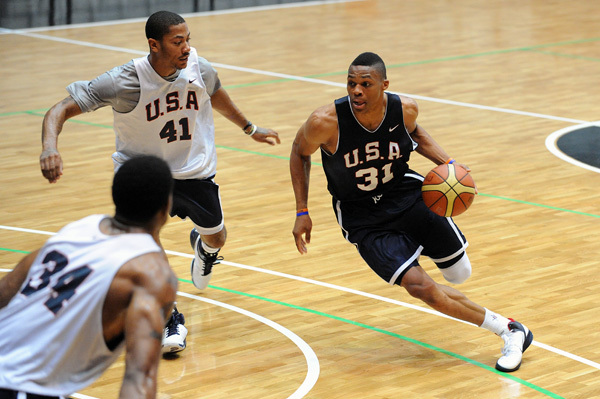 But ultimately the United States’ defense wore them down and forced big turnovers, which led to easy baskets. Kevin Durant continues to step up on offense and was sensational along with Russell Westbrook, who played his best all-around game of the tournament. Lamar Odom also played one of his best games so far. In a subtle way he was the most important player in the game for the United States. Odom was huge on the glass and made things happen with the basketball. Today USA faces Lithuania in the semifinals. They had an exhibition game against Lithuania just prior to the tournament and beat them 77-61. But the U.S. struggled during the first half and didn’t take its first lead until they got into the third quarter, so the score is deceiving. USA will need to get off to a quick start in today’s meeting. They don’t want to let Lithuania build confidence or momentum. 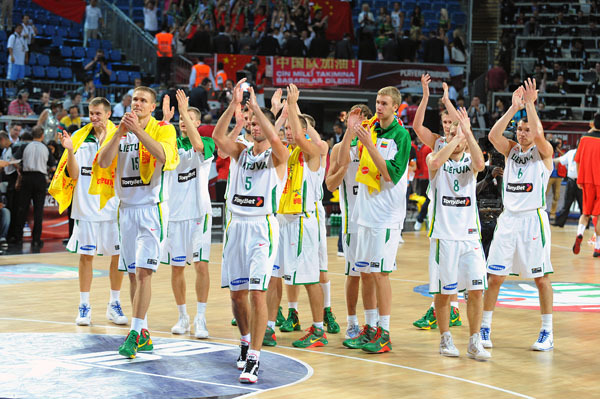 Coming off of seven straight wins, the wildcard Lithuanian team is having an incredible run. And judging from Lithuania’s outstanding performance against number one ranked Argentina on Thursday, they will be Team USA’s toughest challenge to date. Though a small country, Lithuania has a big tradition of basketball and they are hungry for this title. Lithuania pounded Argentina with their great shooting. They relied heavily on 3-pointers, hitting 9 out of their first 11 attempts and finishing with 12 for the game. Both the United States and Lithuania are very physical and athletic, so USA must be on high alert defensively. Derrick Rose will try to push the tempo on offense. 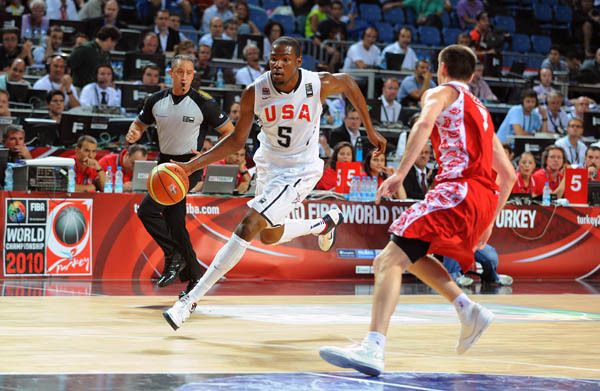 21-year-old Durant will be heavily counted on for scoring, as he’s been throughout the tournament. And Coach K will also be able to turn to his deep bench for reinforcement. In the second semifinal match of the day Turkey will meet Serbia. No doubt the prospect of competing in the finals has the entire host country on the edge of its seat. The Sinan Erdem Dome will be packed with passionate fans who are ready to jam and the atmosphere will be unbelievable. 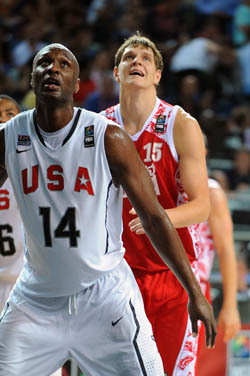 USA vs. Lithuania airs live on Saturday, September 11, 2010 at 12 PM ET on ESPN Classic; replay at 1:30 AM ET on ESPN2. Turkey vs. Serbia airs live at 2:30 PM ET on ESPN Classic. Click here to view the rest of the 2010 FIBA World Championship broadcast schedule. Team USA is only three wins away from gold, but only one loss away from elimination. Today they face Russia in the one-and-done quarterfinals round of the FIBA World Championship. And the rivalry runs deep. In light of the heated exchange between head coaches Krzyzewski and Blatt regarding the Soviet Union’s controversial 51-50 victory over the U.S. for the gold medal at the 1972 Munich Olympics exactly 38 years ago, I expect today’s game to be very emotional for both teams. But Team USA can’t afford to let their emotions get the best of them. They must maintain composure and stick to their game plan in order to succeed against this sizable Russian team. USA may have been a little rattled after squeaking past Brazil by only two points, but they proceeded to win handily over Iran, Tunisia and Angola. 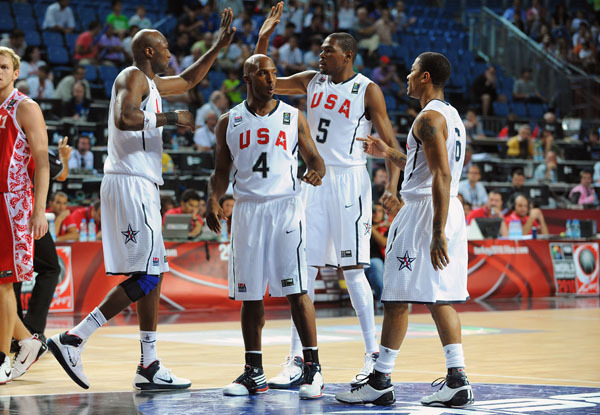 From the beginning of Sunday’s USA vs. Angola game you could tell that the days off were very good for the United States. They came out with fresh legs and high energy; they made shots and shared the basketball. Thirty assists for them in the game was a good sign that they were moving the ball and making shots. Led by Chauncey Billups, who drilled five of seven 3-pointers, their total team effort produced a landslide 121-66 victory over Angola, who was without their leading scorer and completely overmatched as far as the talent level on the floor. When you get down to the final eight teams there are no weak opponents so Team USA is going to have to play at the top of their game from here on out. Today the U.S. will face a different caliber of player in Russia and it will be a much tougher game than Angola. Russia has only dropped one game in the tournament to undefeated Turkey, and they took apart New Zealand, beating them convincingly. They are a tall, physical team anchored by towering centers Timofey Mozgov (7’1″) and Sasha Kaun (6’11”) who are effective under the basket both on offense and defense. Their height on the inside will pose a challenge for this undersized U.S. team. Angola’s style of play was good for the United States because they tried to shoot quickly and run, which opens up the floor. The teams that have made the United States play poorly have been the ones that have been very patient when running their offense and forced the United States to defend over longer periods of time. So look for the disciplined Russian team to try and slow down the quick, athletic USA to limit points in transition. Once again the United States is fortunate to have had a few days off between games to rest up and get in some practices to work on their offensive strategies and defensive tenacity, which was excellent for the majority of the game against Angola and will be imperative against Russia. 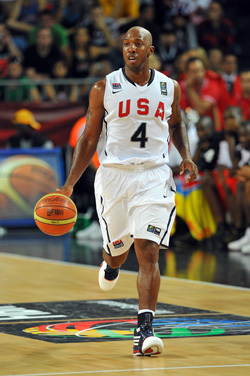 USA vs. Russia airs live on Thursday, September 9, 2010 at 11 AM ET on ESPN; replay at 1:30 AM ET on ESPN2. Click here to view the rest of the 2010 FIBA World Championship broadcast schedule.